Arrive the afternoon of the 24th, where you will be served a Festive afternoon tea and you can relax after your journey. In the evening you will have dinner in the restaurant. 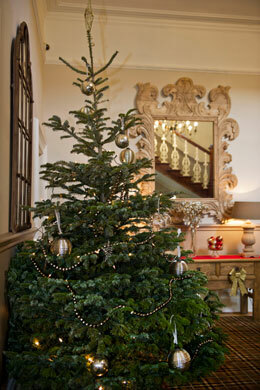 For those returning from Midnight Mass; roast chestnuts and mince pies will be served by the fire in the Garden Room. Wake up and enjoy breakfast, then have the morning at leisure before being served your Christmas Day lunch (click here to view the menu)﻿. A light buffet supper will be available in the evening. After breakfast, time to check-out (by 11am) and travel home. Alternatively, why not delay your journey and stay with us for our Boxing Day lunch (click here to view the menu) too? Please call 01905 779677 or email [email protected], and quote 2 night Christmas Break, to check availability and book.